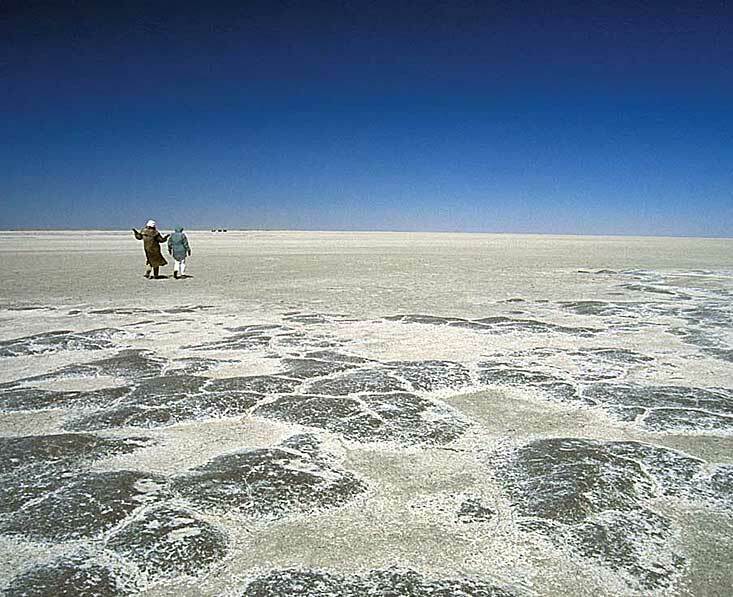 There was once a vast lake in north-eastern Botswana. The salt pans are what’s left of it today. It’s flat and featureless for the most part, yet this doesn’t really sum it up at all. 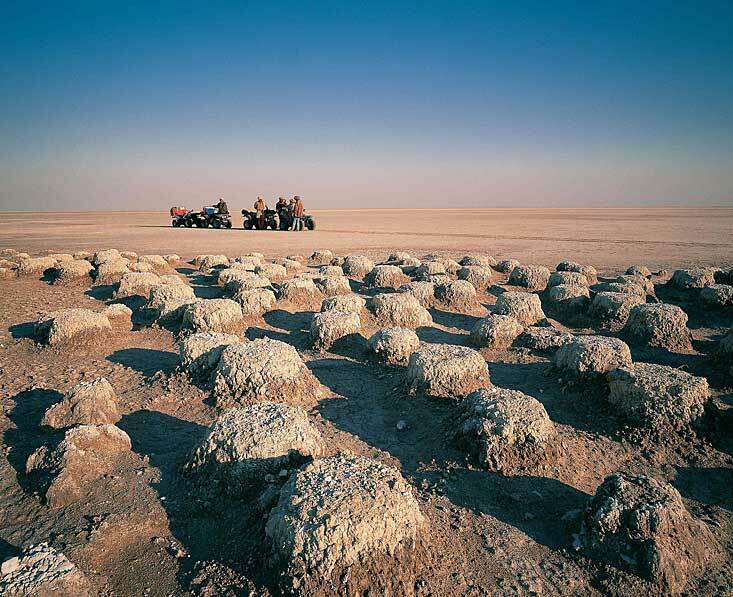 In the dry season the dirty white salt-encrusted land is quite mesmerising in its nothingness, especially at sunrise and sunset, and even nights are special with nothing to distract you from the full intensity of the starry African skies. Ntwetwe Pan and the smaller Sua Pan are the two most spectacular salt pans, and most of the region’s camps are on or near Ntwetwe Pan. Sua Pan is where you find Kubu Island with its strangely-shaped baobab trees, the many fossils and archaeological remains (which show of), testament to the islands use for very early human habitation – including a circular stone wall. It is a magical place to visit but takes several days by quad bike from the camps at Ntwetwe. Over in the far north east of Sua Pan, is Nata Bird Sanctuary. This is an award-winning community conservation project, and when there is water in the pans, thousands of flamingos, pelicans, ducks and geese congregate here. Don’t come to Makgadikgadi expecting large herds of animals unless you are here after the summer rains (around late December/January to the end of March, sometimes into April) when Africa’s second largest zebra migration brings about 20,000 zebra and wildebeest through this region to enjoy the new grasses on the rain-filled pans. That is quite a spectacle, and the predators tag along too of course! 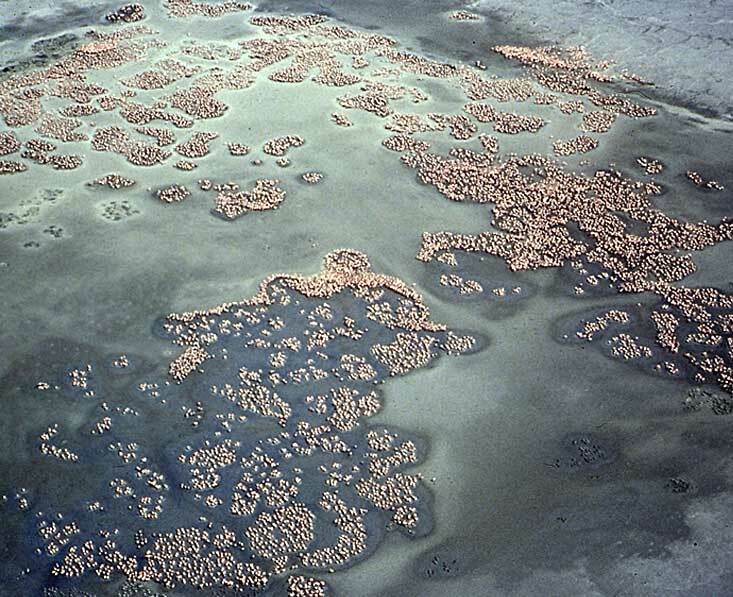 Huge numbers of flamingos can also be found here. This is a great time for wildlife viewing on the Pans. In the dry season wildlife is found, albeit in much small numbers. One of the cutest creatures you’ll find here are the meerkats. There about 3 groups which have been habituated to humans, and meeting the meerkats is a wonderful experience. Rare brown hyenas are also found as residents here, as well as aardvarks, mongooses, ostriches, and reptiles. 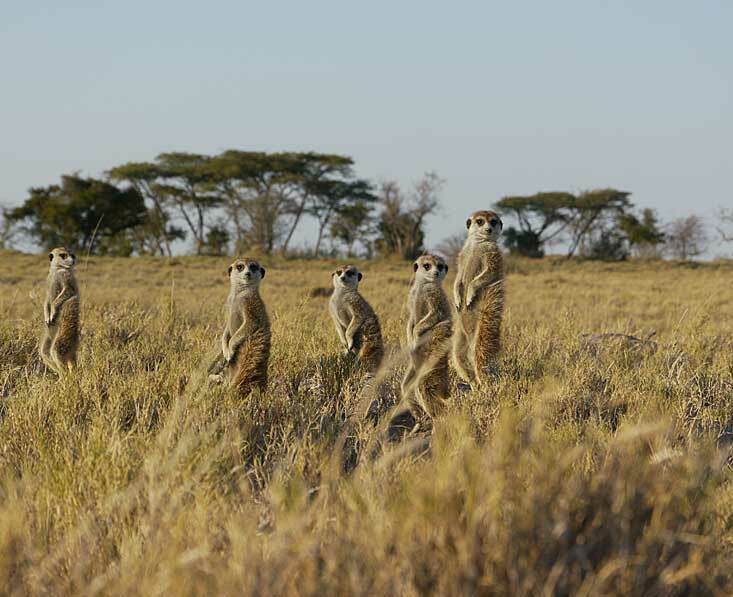 Meeting meerkats (from Camp Kalahari, Jack’s Camp & San Camp) – easiest in dry season. This is one of the few places in the world where you can get really close to these incredible animals. Quad bike on the pans (from Camp Kalahari, Jack’s Camp & San Camp) Please note that helmets are now provided by these lodges, but they don’t actively encourage you to wear them. Be aware that NOT wearing a helmet negates your travel insurance. Without a helmet, if you have an accident you will not be covered at all. Please wear a helmet. 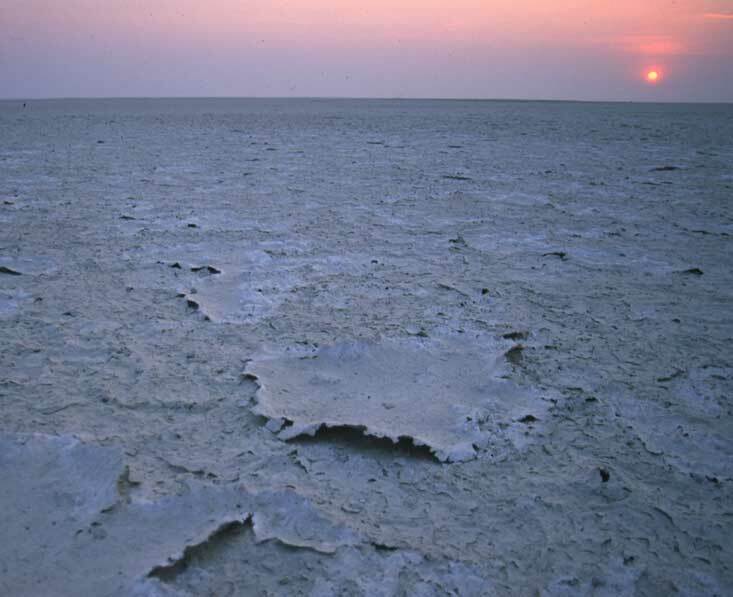 Makgadikgadi National Park and The Boteti River: Perhaps surprisingly, most of the salt pans do not fall within the Makgadikgadi National Park. It covers only a small part of the western edge of the Ntwetwe Pan and the west as far as the Boteti River. 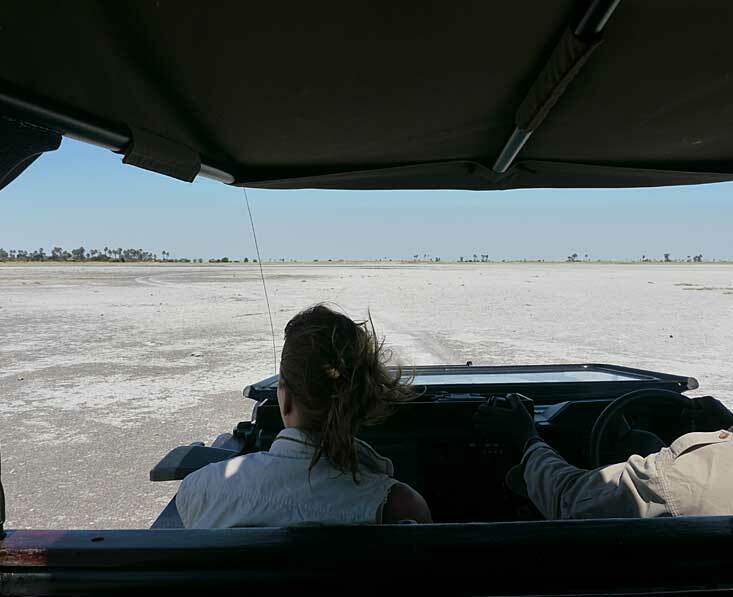 In the dry winter months of roughly May to October much of the wildlife, especially larger game such as elephants, zebra and wildebeest, leaves the harsh dry salt pans and congregates in the lands of the Makgadikgadi National Park and the Boteti River to the west. There are grassy plains and riverine forest along the banks of this river, which is one of the few drainage systems carrying floodwaters away from the Okavango and out to the Kalahari. 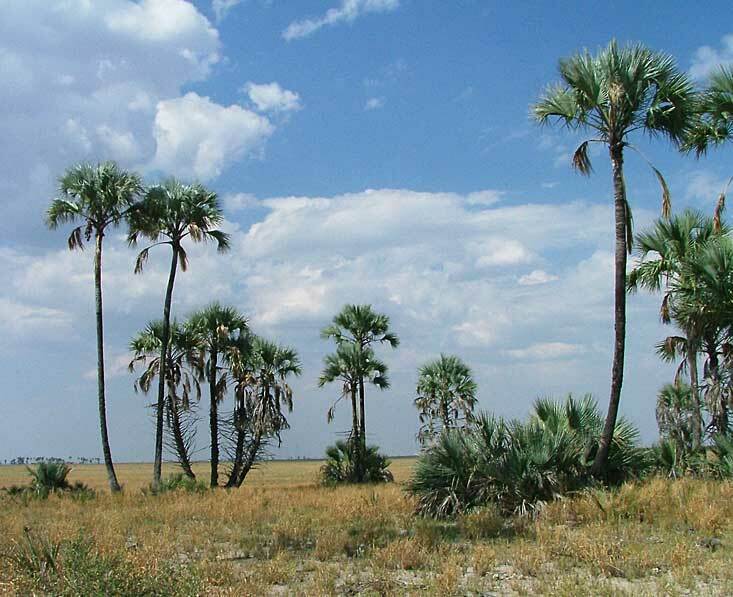 Nxai Pan: Although part of the Makgadikgadi ecosystem, Nxai Pan is a quite strikingly different landscape. The pans here are more grass-covered fossil pans rather than barren salt pans, and there are more islands dotted with acacias. 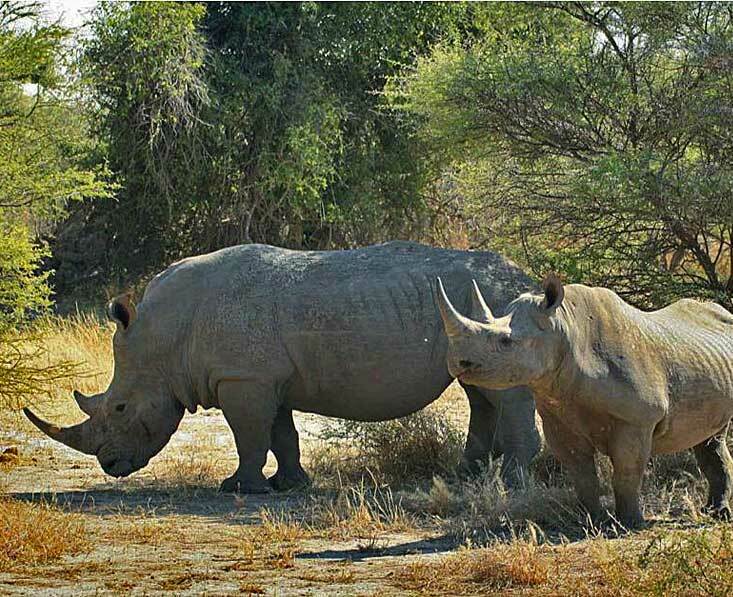 Yes, it is still very dry and harsh in the winter months (June to October particularly), but after the rains have started in about November Nxai Pan starts to become a prolific wildlife spot up until around April. Of course driving can be a little tricky at times because of the rain-filled pans, so be prepared for an adventure! In the dry season Nxai’s waterholes are the real highlight, and are often the place to be for some of the most dramatic predator-prey interactions in Africa. A film called ‘Roar: Lions of the Kalahari’ was filmed here at the park’s main waterhole, as it’s not uncommon for very thirsty animals to come to drink while lions look on in full sight, contemplating when to pounce. Nxai is one of the few places where springbok and impala can be seen together, and giraffes do particularly well here too. In the rainy season you’ll find a good range of wildlife including (some) elephants, buffalos, kudu, bat-eared foxes, honey badgers, lions, hyenas and more. Of course the zebra migration makes its way up to Nxai Pan in the rainy months, so this swells wildlife numbers significantly. Another highlight here is Baines Baobabs in Kudiakam Pan. The contrast between the flat pans and this small island of seven huge baobabs is very photogenic. Thomas Baines painted this now famous cluster of baobabs in 1862. There is only one lodge in Nxai (Nxai Pan) but you could also get here on a mobile safari. We know and love Botswana, and would be delighted to help you plan your perfect Botswana Safari holiday. Call 01473 599083 to speak to a Botswana travel specialists today.